Boil the Basmati rice with a little salt and 1 tsp oil, till each grain is separate and almost cooked. Drain and allow it to cool. I cooked rice on the previous day and refrigerated it overnight. 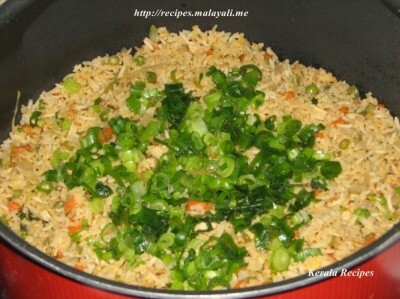 This really helps in making a good fried rice which is not sticky. Heat 2 tbsp of oil in a pan and add onions and saute till translucent. Add all the vegetables (except the green spring onions and broccoli) along with salt and stir fry for around 5-7 minutes till it almost cooked but crispy. Next add the precooked chicken pieces and sprinkle pepper. Stir fry around 5 minutes. Heat another wok or Frying Pan and add 2 tbsps of oil/butter. 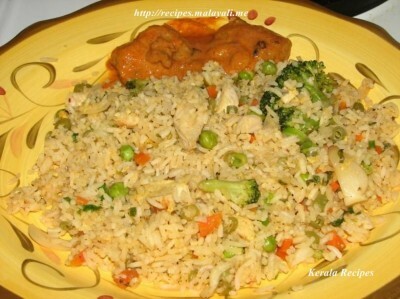 Add the cooked rice and stir-fry for a few minutes so that it gets a light brown color. Stir in the cooked vegetables and chicken and combine everything gently. Make a hollow at the center and pour the beaten eggs. Scramble until the egg sets. Break and mix with rice. Season with salt and pepper. Mix everything gently till the rice is evenly coated with the sauces. Fry the rice on medium-high for another 2 minutes. You can sprinkle some more pepper powder. If you want to reduce the amount of oil or butter, you can skip steps 6 and 7. 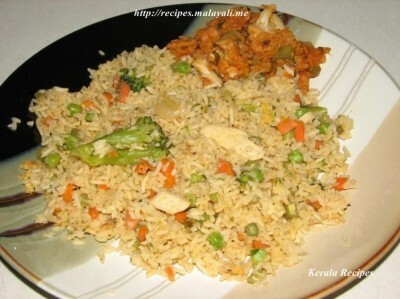 Instead, add the boiled rice directly without frying to the cooked vegetables and chicken. Clean the chicken and chop it into small pieces. Heat oil in a skillet and add the chicken pieces. Add some teriyaki sauce or soy sauce and cook the chicken on medium heat till it becomes tender. Thanks a lot for reminding me. I have edited the recipe to mention the amount of chicken used. The recipe looks good. Had to mention the Purdue chicken,I would not use it. Purdue chickens mistreat their chicken, use antibiotic and growth hormones. They are bad for you. I would opt for free range, antibiotic free and if possible organic chicken. Thanks for the suggestion Aaina.. I use Perdue Chicken only once in a while, when I am in a hurry. Else I try using organic varieties. did u try putting celery in this. it tastes good. Another winner from this site:-)Made without the chicken and it is so amazing. Thank you! Hi. Can you tell me how many people this recipe serves? Thank you.